Also FirePasswordViewer can be used to display sign-on secrets from different profile (other than current profile) as well as from the different operating system (such as Linux, Mac etc) altogether. This greatly helps forensic investigators who can copy the relevant files from the target system to test machine and view the credentials offline without affecting the target environment. The displayed sign-on information can then be saved to a file in standard HTML format which can be used as valuable and quick offline reference. 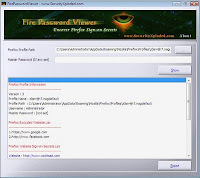 Anda sedang membaca artikel tentang FirePasswordViewer 2.1 dan anda bisa menemukan artikel FirePasswordViewer 2.1 ini dengan url http://www.nova13.com/2010/05/firepasswordviewer-21.html, Anda boleh menyebar luaskannya atau mengcopy paste-nya jika artikel FirePasswordViewer 2.1 ini sangat bermanfaat bagi teman-teman Anda, namun jangan lupa untuk meletakkan link postingan FirePasswordViewer 2.1 sebagai sumbernya. I ever try this one. But I can't use it well. Haha. Good information. I'll try it. @rizkythea: yups sob! itu digunain kalo kita lupa ama password kita, di firefox.